Auto flow beehives use proprietary technology to give beekeepers a number of benefits. They allow beekeepers to harvest honey without having to open the beehive. Additionally, auto flow hives make honey harvesting less risky for beekeepers. Honey flow frames are an important component of Flow Hives and are central to the technology. They are specially designed beehive frames that work with Flow hives. Flow has several configuration of honey flow frames for sale and in this article we’ll go through each of them. Honey flow frames are specially designed beehive frames for use with Flow hives. They are made using food safe plastic. The plastic is often clear so you can see if your bees have built up enough honey reserves. Honey that is ready for harvesting in the Flow hive requires you to operate a mechanism on the frames for it to be extracted. Honey flow frames are made into partially formed honey cells on both sides. Bees build the remaining sections of the honey cells until they are of the right size. They then put honey into the cells and seal them. A flow frame is not fixed down the middle. It is capable of moving a small distance to offset the honey cells on the inner side of the cell. A twist of a Flow key offsets the flow frame and creates an opening in the honey cells. Honey flows out of the opening into collecting tubes which empty into a flow tube. At the end of the flow tube is a honey gate. This is a valve that can be opened and closed by the beekeeper. When harvesting honey, the honey gate is opened and a honey container placed underneath it. When you are not harvesting honey, the honey gate is best left closed. Bees in a Flow hive are largely undisturbed during honey harvesting. No bees are harmed in the process too. This is because the honey flow frames largely move vertically against each other. There is very little movement away from each other. The two parts of the frame only move apart from each other a small distance to allow honey to flow between the two sections. A turn of the Flow key returns the separated sections back together. This is a large super box for use with honey flow frames that fits a 10-frame sized Langstroth beehive. The frames are made and sold by Flow, the company responsible for the invention of honey Flow technology. These frames are durable and do their job well. They deliver well on their promise of making honey harvesting a breeze for beekeepers. These frames are compatible with your existing beehive boxes. The boxes should be of the 10-frame size. There are 7 frames in this set of Flow frames. They split down the middle and channel honey to a single outlet using their tubules. This makes collection of honey and packaging easy for beekeepers using the Flow frames in their apiaries. The frames are made using high quality food-safe plastic. Honey stored and harvested from these frames is safe for use in human food. Harvesting honey with these frames is easy. It only requires you to turn the Flow key and be ready with a collecting jar or other suitable container. You can package honey directly into clean mason jars with Flow technology, bypassing the need for an extractor altogether. Experienced and beginner beekeepers have an easy time using these Flow frames in beekeeping. The frames comes with its Flow key and an instruction manual. The manual is well detailed and a great reference for when you are working with the Flow frames. The frames is sold alongside a wooden beehive box. The box is suitable for use as a honey super. It is made using North American red cedar wood. The wood is grown in sustainably managed locations and harvested in a sustainable manner. This beehive box comes unassembled so you have to put it together before installing the honey flow frames. An observation window in the side of the beehive box is great for checking on the bees. You easily know when your honeybee colony has made enough honey and stored it in the frames ready for harvesting. This saves you from frequent opening of the hive during the honey flow season. When you cannot resolve an issue with these frames, just reach out to the manufacturing company, Flow. The company is happy to assist you and answer your queries through their dedicated customer care channels. You can only harvest honey from the box. Beekeepers aiming to harvest and benefit from other beehive products such as wax have to use wooden frames in separate beehive boxes. These are versatile honey flow frames made and sold by the inventors of Flow technology. The frames make use of the revolutionary Flow technology to give beekeepers options in the setup of their Flow hives. These frames can be arranged in different numbers starting from 4. This allows the frames to be used in beehive boxes of varying sizes. They can fit both 8-frame and 10-frame sized beehive super boxes. Beekeepers can also use a few Flow frames together with wooden frames in the same beehive box. This gives beekeepers the option to harvest other beehive products in addition to honey. These frames are sold in a set of 7. They are packaged together with their respective Flow tubes and a Flow key. The frames are easy to put together in a set that fits your Langstroth beehive boxes’ sizes. Honey harvested from these frames is safe for human consumption. The frames are made using food grade transparent plastic. The plastic also has the added advantage of allowing you to see how much honey has been stored inside it. You easily know when it is time to harvest honey during honey flow season. This is especially aided by beekeepers having observation windows in the boxes of their Langstroth beehive stacks. These durable frames are great for honey storage. Bees cap the cells in the frames and beekeepers can keep the honey in the frames for long. Honey stored in these frames does not ferment or absorb odors. It stays preserved in the frame with no nutrient loss as well. You can use these frames in your existing beehive boxes with minor modifications. They save you the need to buy or build new beehive boxes when adding Flow technology to your apiary. These frames make honey harvesting easy on bees and the beekeeper. There is less beehive disturbance and fewer bees end up being squashed in the honey harvesting process. For the beekeeper, there is less opening up of the hive and lifting of beehive parts to be done. All components of this kit are manufactured in the USA and in Australia. Beekeepers buying these frames are assured of quality and given a 12-month warranty. These frames are not usable in the entire beehive. Brood boxes require beekeepers to use regular wooden frames. This is because honey flow frames are not suitable for brood rearing. They are only built for honey storage by bees and harvesting by the beekeeper. The Flow Classic Cedar 6 Frame Super comes complete with 6 Flow frames, 6 Flow tubes and 1 Flow tube. These honey flow frames are easily seen through viewports built into the super box. The super is made using Western red cedar wood. The 6 Flow frames allow for maximum space use in the beehive. They store more honey per square inch of comb due to bigger cells. 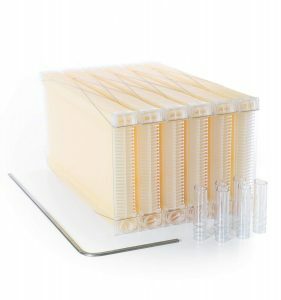 Flow frames are not designed for brooding – only for honey storage in the super box. As is common with most Flow products, a well written instruction manual is included upon purchase. 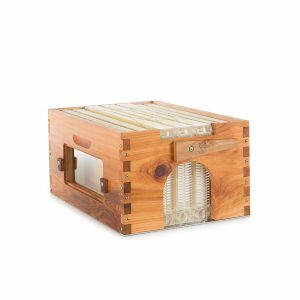 The Flow Classic Cedar 6 Frame Super fits well onto your Langstroth beehive. Additionally, the Flow frames work well even in other supers if you do not wish to use them in the super box they come in. These frames last for long and are built using excellent quality material. The plastic used in making the frames is food grade. Stainless steel is used on the frames to give them some additional strength. These Flow frames are a nice addition to your apiary. The frames work best with an 8-frame Langstroth beehive. They are not adjustable in their length, width or height. 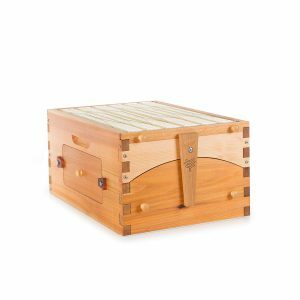 The Flow Classic Cedar 6 Frame Super is suitable for both intermediate and experienced beekeepers that are looking to add the number of super boxes in their beehives. The frames have nicely sized cells that allow storage of a large amount of honey. These frames are great for honey production in both small and large apiaries. These honey flow frames are great for beginners and experienced beekeepers who want to have the benefits of Flow technology in their apiaries. They come together easily and do not need taking apart once assembled. Working with these frames is easy throughout the year. They can be present on your beehive through summer, winter, autumn and spring. The material used to make the frames does not expand or contract at a scale large enough to warrant removal in winter. This makes the Flow official super classic cedar 6 frame Flow frames a complete solution for beekeeping using Flow technology. These frames are not adjustable in their number. You can neither add frames to the set nor remove them. This makes the frames only suitable to a designated size of Langstroth beehive box. These frames make honey harvesting a breeze for beekeepers and minimize harm to bees. They do not need you to open up the beehive to harvest honey. The frames are made and sold by Flow, the company founded by the inventors of Flow technology. Beekeepers purchasing these frames are assured of authenticity and quality. The frames last long and are made using food-safe plastic. Buying this set of 6 flow frames gives you a complete package to install and enjoy having Flow technology in your apiary. 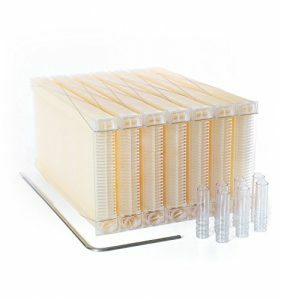 The frames come with 6 honey collecting tubes and a Flow key. The key is for operating the frames to split honey cells. Once split, honey flows from the cells into the collecting tubes that channel it to your collecting tube and containers. The frames empty completely to give you a full honey harvest. These honey flow frames are very efficient and give you pure honey. They are nicely put together with excellent craftsmanship. The frames move apart along each other a small distance when you insert and turn the Flow key. Once the honey has finished flowing from the frames, turning back the key and removing it allows the frames to come together again. The frames come together tightly aided by a reinforcing metal wire running along their tops. The frames come with wire, so you do not have to add one yourself. Beekeepers using these frames are advised not to use them in brood boxes. The frames are built for honey storage by bees only. They do not perform well when used as brood frames. For brood frames, go for standard wooden frames of a number depending on the size of your brood boxes. These honey frames are built in a unit to fit an 8-frame beehive super box. Both beginner and experienced beekeepers can use these frames in their apiaries with ease. The frames are accompanied by a manual that explains their use and setup very well. The frames are made in the USA and Australia. Beekeepers are assured of excellent quality and good working of the frames. These frames are useful only on a single size of beehive box. To use the frames in a 10-frame Langstroth beehive box, beekeepers have to buy additional frames and add them to these 6 frames. Beekeepers can also use wooden frames to harvest beeswax from them. These frames are an innovative package by Flow, the company behind the invention of Flow technology. They allow beekeepers to only take a fraction of the effort and time they would have taken to harvest honey using wooden beehive frames. This is because the frames make it possible to tap honey directly into a jar right from the beehive. Using these frames requires you to buy a beehive box from Flow or modify your existing beehive boxes. When modifying your beehive boxes to make them compatible, make sure to include observation windows. Using the Official Flow Frame Classic 4 is easy for both beginner and experienced beekeepers. This is because the frames are not about the art of beekeeping but rather setting them up and harvesting honey using Flow technology. 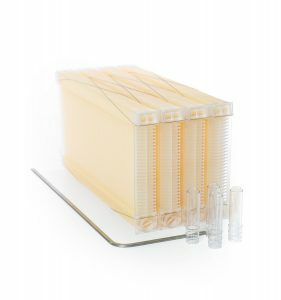 To harvest honey using these flow frames, insert the Flow key and turn it 900 to split honey cells. The honey flows from the split cells by gravity to honey tubes and into your collecting container. All honey is easily drained from the frames this way. The honey is pure; free from eggs and larvae of honeybees. With an observation window in the beehive super box, you can see if bees have built up stocks of honey ready for harvesting. This avoids having to open up the beehive. The reduced disturbance gives your honeybee colony more time to carry out beehive activities and build their stocks of honey. These honey flow frames are not enough to take up all the space in a single Langstroth beehive regardless of its size. They fit into both 8-frame and 10-frame Langstroth beehive boxes. The space left over after installing them is best used up with wooden beehive frames. Bees may draw comb on the frames to give you honey and bees wax in addition to the honey you harvest from the flow frames. This is especially important for beekeepers who want to harvest a variety of products from their beehives. Bees are not squashed during honey harvesting with these frames. The frames also make opening up the hive unnecessary. Reduced disturbance of the beehive makes honey harvesting a safer exercise for beekeepers with reduced risk of getting stung. These honey flow frames fit into any beehive box you have and leave space for wooden beehive frames. As such, harvesting more than one beehive product is possible with the frames. It helps to minimize the risks beekeepers have to deal with and makes beekeeping more profitable for the beekeeper. Beekeepers that want more honey and less of other beehive products have to buy additional flow frames. This is because the 4 frames in this set are not enough to take up all the space available in Langstroth beehive super boxes. This is an innovative balance that allows the utilization of Flow technology in beekeeping. 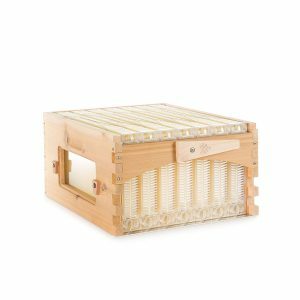 It is packaged as a wooden Langstroth super beehive box with honey flow frames inside it. The frames are sold in a set of 3 that take up some of the space in a Langstroth-style beehive. Space that is left over can be used for more flow frames or standard wooden beehive frames. Beekeepers want to harvest a number of products from beekeeping depending on their preferences. Some would like to harvest wax from the beehive as part of their beehive products. The mix of Flow frames and standard wooden frames allows beekeepers to also harvest honey and honeycomb from their beehives. The set of flow frames you get when you buy the package does not come with wooden frames. You will have to buy those separately if you wish to use them in your beehive. The 3 flow frames in the package have their 3 flow tubes included. The Flow tubes attach to frame outlets and help you collect honey at the frames’ honey outlet. These tubes are assigned one each to a frame. The set is sold with its Flow key as well. A Flow key is crucial in flow frame use. It is used to split cells so honey can flow out. These honey flow frames are made by Flow, the company founded by the inventors of Flow technology. With these frames, you are sure that you are getting an authentic and high quality product. Flow technology is a result of extensive research and the desire to reduce harm to bees when harvesting honey. The wood used in making the beehive super box is western red cedar. It is durable and very friendly to bees. The wood is also makes strong boxes when joined properly. The set comes dissembled in flat-packaging. You assemble the beehive box yourself and set up the frames. This is easy to do for both experienced and beginner beekeepers. An instruction manual on how to go about doing everything is included with your purchase of the frames. The manual is very handy for assembly of the flow frames and super beehive box. The number of frames in this set is not enough to take up all the space in the beehive box. This requires beekeepers to have wooden beehive frames in the beehive box next to flow frames. However, beekeepers who want the beehive box to have flow frames only have to buy additional flow frames. Beekeepers want original, high quality equipment for their apiaries. They are better off with authentic products from reliable and reputable suppliers and manufacturers. Purchasing authentic honey flow frames is important for successful, effective and profitable deployment of Flow technology in an apiary. Beekeepers just starting out in their beekeeping journey should not feel afraid or be intimidated about getting authentic frames. They can just as easily purchase authentic honey flow frames as professional or experienced beekeepers do. All authentic Flow frames carry the official Flow logo. Visit the store and check out the frames you will be buying. Assess them for their weight and how the frames feel in your hands. Good quality frames are weighty without being too heavy. They have clear plastic but are not brittle. If the frame feels off, do not buy it. If buying online, visit the Flow website. See their description of the flow frames and the materials used to make the honey Flow frames. Top quality frames are made using the best clear plastic. The manufacturer should also have a picture of the frames they are selling on the website. Reviews of the frames by previous buyers will help you know about their suitability for your beehives, their durability and their ease of use. Ask around. Beekeepers are a happy lot and ready to share useful views and opinions. Ask about Flow frames at your beekeepers’ club meeting. You may also hit online forums for beekeepers and see what you can get about the Flow frames you are planning to buy. These beekeepers’ meeting platforms give you access to true reviews and perspectives from people who have similar interests as yours. Honey flow frames are changing the way beekeepers practice their beekeeping. By being friendly to bees and giving pure honey, these frames also help you make better use of beehive space. Beekeepers who are setting up their apiaries or expanding the existing ones may at one time consider one of these honey flow frames in their apiaries. Once you have settled on a kit to buy, make sure to keep the Flow tubes and the Flow key safely stored where you can easily find it. However if you do lose a key, contacting Flow is easy and they are ready to send you a replacement alongside other parts you may need. Honey flow frames add a touch of modern technology to your beehive while saving you costs on honey extraction and harvesting equipment. These frames in their various kits and standalone frame sets are great gift items too, for a friend or family member setting out on beekeeping. Do you own any of the honey flow frames on this list? Which honey flow frames(s) do you think should be added to this list? Leave a comment below and let us know. Be sure to verify that the manufacturer has had the plastics tested. BPS is NOT the only ingredient in plastics with potentially toxic properties. The original Flow product has been tested according to their web site.